Diving Socorro Island and the Revillagigedos archipelago is a thrilling adventure that is unforgettable. Close encounters with giant mantas and sharks will leave you breathless, and there is a chance of swimming with dolphins or humpback whales. The Revillagigedos Archipelago, more commonly called Socorro is located in the eastern Pacific Ocean approximately 250 miles south of Cabo San Lucas, Mexico - at the tip of the Baja peninsula. These islands have been compared to the Galapagos Islands in Ecuador, and Cocos Island in Costa Rica because of the big animal encounters they provide. The Revillagigedos Islands consist of 4 islands - San Benedicto Island, Socorro Island, Roca Partida and Clarion. They are quite remote and wild, and have been referred to as the Mexican Galapagos. 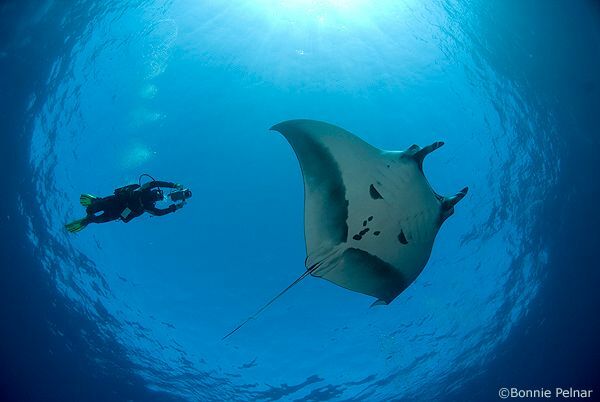 Socorro Island and the surrounded area is famous for up close and personal encounters with the Giant Pacific manta ray, which can grow to 22 feet from wingtip to wingtip. People see giant mantas on most trips, on many of the dives. There are lots of sharks in the Revillagigedos Islands - hammerhead schools (if you go deep), white tips, silver tips, silkies, duskies, Galapagos and occasionally tigers. Many sharks are seen on every trip. While diving Socorro you can also encounter pods of wild bottlenose dolphin on a regular basis and from January through March. 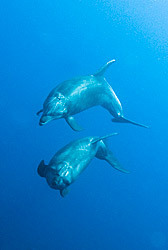 Socorro island is the place for dolphins, so make sure your trip will visit that island if swimming with dolphins is important to you. The Socorro islands are also home to a large population of humpback whales, that come here to breed and calve. We have observed several newborn humpbacks in the years we've been fortunate enough to visit these remote and pristine islands. Although some divers do see humpbacks underwater at these times, it's certainly not guaranteed. I think Feb to Mid-April is a better time for Humpback whales. Here's some Humpback underwater photos from a recent Socorro Island trip. Jacks and Tunas are also frequently seen. Whale sharks have been sighted (November is the best time), but I would not say it's a common occurrence. 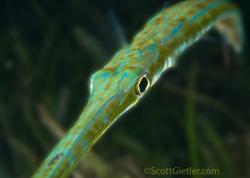 Socorro is not an area for coral, or for critters, so try to focus on the big stuff! If you do like macro, blennies are quite common and make for good photography subjects, and there are some nudibranchs. Dolphins swimming underwater at Socorro. Diving at the Revillagigedos Archipelago can be challenging. A diver must deal with strong currents and choppy seas, and you are often without a guide. This is not a place for inexperienced divers. El Fondeadero is often dove first. Its generally pretty calm and not too deep so its where some boats go checkout dive. There are three large pinnacles full of lobster, fish, eels and occasionally shark. A large pinnacle rises to about 20 feet from the surface, so you can't see it from topside. The surf and swell running across the top sometimes making the water look like its boiling. 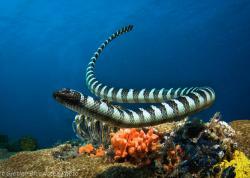 The pinnacle is small enough to swim around during one dive and its very majestic looking from all angles. The bottom is at around 160' so getting your weights right and not being too heavy is very important. This area is a popular cleaning station for the giant Pacific manta. They gather here to be cleaned by the Clarion Angelfish. It is usually just a matter of a few minutes in the water before the mantas started to show up. As they approach, they look you right in the eye, and you DO feel like you are communicating with them. On a past trip in March, Rey, two other divers, and I were fortunate enough to see a humpback whale underwater here, and shortly after, a Tiger shark. This is also the place that my friends had three humpbacks stay with them for several days. I was really hoping we would see the whale underwater, but enjoyed the music nonetheless. "El Canyon" is on the south end of the island. It was here that I had seen many mantas, dolphins, Galapagos sharks, silky sharks, and schools of hammerheads off the point. Cabo Pearce is located on the east side of Socorro Island. The boat anchored in calm cove surrounded by rocky red cliffs. The pangas took us off to a long finger of rock that stuck out into the ocean. We were surrounded by dolphins all the way. When we rolled back into the water we were immediately greeted by 20-30 friendly dolphins. I've seen dolphins here every time I've been here, but never this many before. They stayed with us through the entire dive. During our surface interval the pangera took us for a ride to the nearby caves. A humpback whale surfaced about 50' from the boat hung around for a while. We hoped to see it on the next dive, but the whale had already left. Instead we had several very friendly mantas that kept us entertained through the whole dive. Punta Tosca is another site on Socorro Island. There are often playful, sociable dolphins here, and sometimes Silky sharks. The afternoon dives were done on the other side of the island at a spot called "The Aquarium". Since this was a macro dive I decided to sit this one out and take some pictures of the boat and the divers instead. We could see whales just offshore the entire time we were there and we enjoyed a beautiful sunset. Roca Partida is a guano covered pinnacle about 85 miles from San Benedicto Island. About 100' high and as long as a football field, the pinnacle is in the middle of nowhere and is a magnet to pelagics. This is where I've seen many sharks, mantas, huge schools of fish, and whale sharks (you must be very lucky) on past trips, but this is Mother Nature and I knew there were no guarantees. A diver on a recent trip saw Oceanic whitetips and Scalloped Hammerheads here in January. Another sunny day and calm conditions had me worried that things might be too calm for any good pelagic activity, but as soon as we got into the water we saw mantas, sharks and large schools of skip jack and yellowtail. We didn't have much current except around the corners, but it was nothing we couldn't handle. This seemed to attract all kinds of life. Just off the rock we saw a school of Silvertip sharks, something I hadn't seen here before. 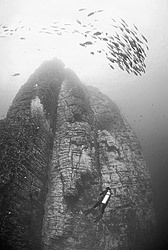 The pinnacle goes straight down to the bottom at about 200+ feet, so all the dives here are like a bottomless wall dive. At 60' there are several caves where we found sleeping whitetip sharks every time. During a dive we could swim all the way around the rock unless we got distracted by mantas or sharks, which was most the time. We had mantas on every dive and because the visibility was so good we had some amazing photo opps. I have shot thousands of mantas, but never get sick of the last 20 minutes of the dive when the mantas cruise around the divers at the surface. We had beautiful sun rays on every dive and lots of manta that were happy to swim right through them for me. The conditions here were fantastic, so we decided to stay for two days of diving. Revillagigedos Islands trips are only available November through May due to weather conditions. 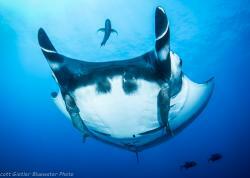 During these months all the mantas and sharks are plentiful. The water temps are 75F - 80F in November, December, beginning of January and late April and May. In late January, February, March and the beginning of April the water varies between around 70F - 74F, but the humpback whales visit Socorro during the cooler water months. You can hear these gentle giants singing on almost every dive and underwater encounters with these whales are increasing every year. One diver who just returned from a January trip has decent visibility and great encounters with Mantas, Dolphins, Oceanic Whitetips, a Silky shark, and Hammerheads. Depends on wind, rain, currents and tides. On a good day at Roca Partida or the Boiler visibility can be 200'. 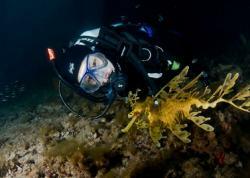 There have been days where divers could see all the way to the deep ocean floor. 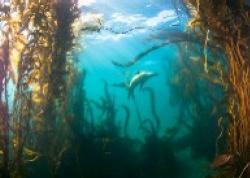 At sites like El Canyon and The Aquarium it may be less than 100'. El Fondeadero usually has the worst vis at 50'. Most of the reports of lower vis (30-40) were in Nov/Dec, and only at some sites. The area can only be reached by live-aboard. There are no hotels in on most the islands no place where you could get off the boat and walk around. Liveaboard boats sail out of Cabo San Lucas, Mexico. The journey is 24-28 hours each way, and can be rough, so take sea sickness precautions. The SolmarV and the Nautilus Explorer are the boats that visit Socorro. On some trips, I limit myself to a single lens, the Nikon 10.5 mm fisheye. This proved to be a great choice for capturing the close encounters with big critters like mantra rays and the whale shark. The tokina 10-17mm fisheye would work equally well. I personally find that concentrating on a single lens, as opposed to changing my system every few dives, helps me to get better results. 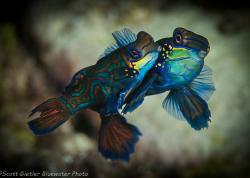 But there certainly are interesting photo subjects for your longer lenses, from beautiful clarion angelfish, golden trumpet fish, big lobster and free swimming green moray eels, to tiny gobies, blennies and even nudibranchs. From the diminutive creatures to the behemoths, the most important factor is to get close to your subjects, and aim your strobe(s) carefully to avoid backscatter. After that, it comes down to elements of composition and negative space, plus your skill in approaching these often shy photo subjects, and that will result in good images. Submitted by michael (not verified) on Thu, 2010-12-09 11:07. I shoot UW with digital compacts with no strobs for years (Canon S90 lately) and wonder how will it work for location like Socorro. Submitted by Octopus George (not verified) on Mon, 2012-04-16 14:45. Submitted by michael (not verified) on Thu, 2010-12-09 11:04. This is terrific write up about the destination I was drooling about for quite some time. It looks like I may go this year. I shoot digital compacts without strobs for years (Canon S90 lately) and wonder how will it work at Socorro. Submitted by Tim (not verified) on Wed, 2010-04-14 13:29. ... sometimes it's more of a struggle. 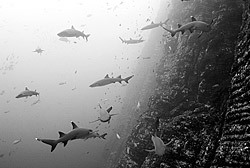 In March 2010 a heavy swell made the crossing unpleasant for many of the divers, stirred up the bottom at San Benedicto and swept everything but the white-tip reef sharks off Roca Partida. That is diving in the wild (and this is well off the beaten track)and whilst I managed some exciting images, it wasn't easy: go prepared to the make the best of what's going on (I should have, but didn't, take a good telephoto for the humpback whales). Submitted by scottg on Wed, 2010-04-14 16:17. Tim - thanks for the feedback, I've heard from several people about that one rough week in March, with very limited visibility.